FEW outside her homeland would dream these days of criticising Aung San Suu Kyi, Myanmar’s opposition leader. On her tour of Europe last month, she was swaddled in praise verging on adulation. Her dignity, courage, intelligence and good humour confirmed her many longtime admirers in their good opinion and won her new ones. But at home she is now a politician, not a political prisoner. Flak comes with the territory. Myanmar’s election commission has chided her for not “respecting the constitution”, by repeatedly calling the country not “Myanmar” but “Burma”. Perhaps more worrying for her is that groups representing Myanmar’s ethnic minorities are voicing doubts about her. It was an awkward dilemma that some local analysts are convinced was deliberately created by Myanmar’s army. If the generals did have a hand in fomenting the violence they would have had several aims: to embarrass Miss Suu Kyi with either—or both—her domestic and foreign audiences; to reassert their own importance, which was demonstrated when a state of emergency was declared in the state; and to deflect attention from campaigns elsewhere, notably against ethnic-Kachin rebels. The Rohingyas are a special, appalling, case. In Europe Miss Suu Kyi, fielding questions by stressing the importance of the rule of law, managed to avoid offence. But her relations with other, more accepted, ethnic groups are also delicate. Ever since Burma’s independence from Britain in 1948, the country, which has more than 100 recognised minorities, has faced secessionist rebellions on its periphery from a score of mostly ethnically based insurgencies. These people are much more than a few recalcitrant hill-tribes. Huge tracts of the country, holding perhaps one-third of its population, are “minority” areas. Many have a long history of bitter war with the army and some are heavily involved in producing narcotics. Thant Myint-u, a historian of Burma, has written of the tendency to view Myanmar as “a failed Eastern European-style revolution…when a more apt comparison is with similarly war-torn societies like Cambodia or Afghanistan.” When asked about this last year, Miss Suu Kyi dismissed the comparison, saying Myanmar is not that bad. But part of the self-image of the junta in power until last year was as the guarantor of the country’s integrity. The junta saw the army as the only thing that was saving Myanmar from the centrifugal forces of the insurgencies. It reached ceasefires with most of the insurgents. But there were no peace agreements and the rebels remained armed and, mostly, in tactical political alliance with Miss Suu Kyi’s National League for Democracy (NLD), in opposition to the army’s rule. The junta has now made way for a civilian government, albeit one dominated by former soldiers, and this April the NLD rejoined mainstream politics. Miss Suu Kyi and 42 of her colleagues now have seats in parliament. Among the ethnic groups, old suspicions linger that the NLD is a party of the Burmans with no real commitment to the interests of the minorities. One Kachin website objected to Miss Suu Kyi’s response when asked in London about her reluctance to condemn the army’s offensive against the Kachin, whose unresolved rebellion is, at present, the most serious of many. A 17-year ceasefire with the Kachin broke down in June last year. Fighting has displaced an estimated 75,000 people, including up to 10,000 across the Chinese border. There have also been clashes with another group, the Shan State Army (South). Miss Suu Kyi suggested that resolving strife was not about condemnation, but about “finding out the root, the cause of the conflict.” For the writer, this was obvious: “the systematic exploitation and dehumanisation by successive Burmese governments”. The new government has managed to reach peace agreements with a number of rebel groups, such as the Karen, the Chin and the Mon. And informal peace talks have begun with the Kachin. But they and other groups remain deeply suspicious of the government’s sincerity—and of its ability to tell the army what to do. At times over the past year, it has appeared to ignore Mr Thein Sein’s instructions to stop offensive action against the Kachin. As for the NLD, Miss Suu Kyi and other party spokesmen have for years defined its ethnic policy by calling for a “new Panglong agreement”. This refers to a document signed in 1947 by Miss Suu Kyi’s father, Aung San, Burma’s independence hero, with Shan, Kachin and Chin representatives, promising “full autonomy” in the frontier areas. Mr Thein Sein also says the peace deals he pursues are based on the “spirit of the Panglong Agreement”. So a reformist government and its main opposition party—which judging from by-elections in April enjoys huge popular support—are in accord. Myanmar needs a comprehensive peace settlement with its minorities under which they will enjoy great autonomy. Prospects for lasting peace should look better than ever. 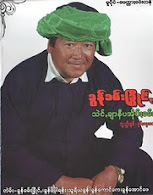 Panglong, however, was, as that Kachin website notes, “failed”. The legacy of the long conflicts is so bitter, the suspicions of the army so deep, and the legal and illegal commercial interests so numerous, that settlements remain elusive. 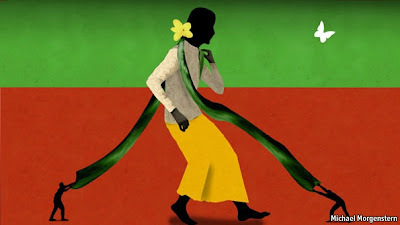 The risk for Miss Suu Kyi and the NLD is that, as they entrench themselves in politics, they become not the vehicle of reconciliation, but part of the enemy that ethnic minorities have spent a lifetime fighting.